I got up early this morning, long before the convent bells. I had my traditional pre-race meal of oatmeal and hot tea. I kissed my sleeping daughters and my sweet husband wished me luck. 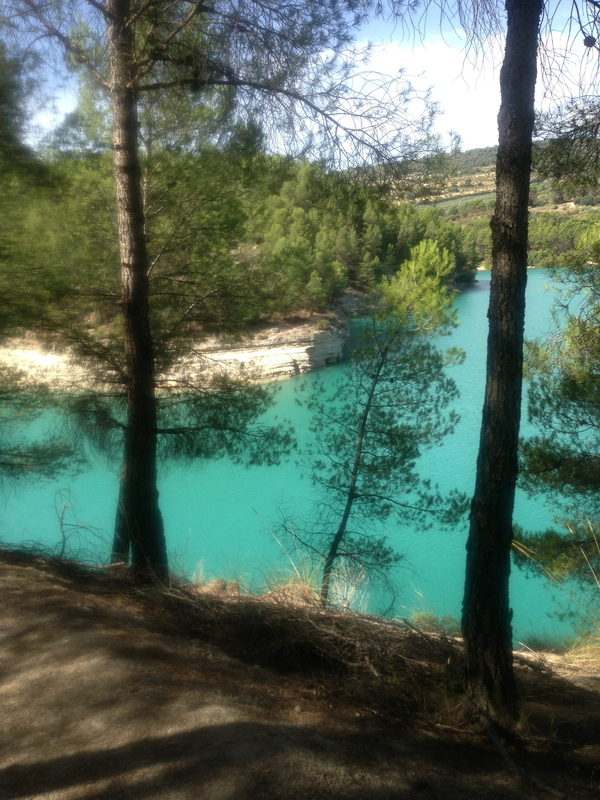 I hiked down the hill to meet our friends, Paul and Fernando to drive to Guadix. Paul’s client, Dominic who was in town for a running holiday from Hong Kong was also joining us. We piled into Paul’s little car and set off on the road to Granada in the dark. As we drove I could see the sun coming up behind a distant mountain. 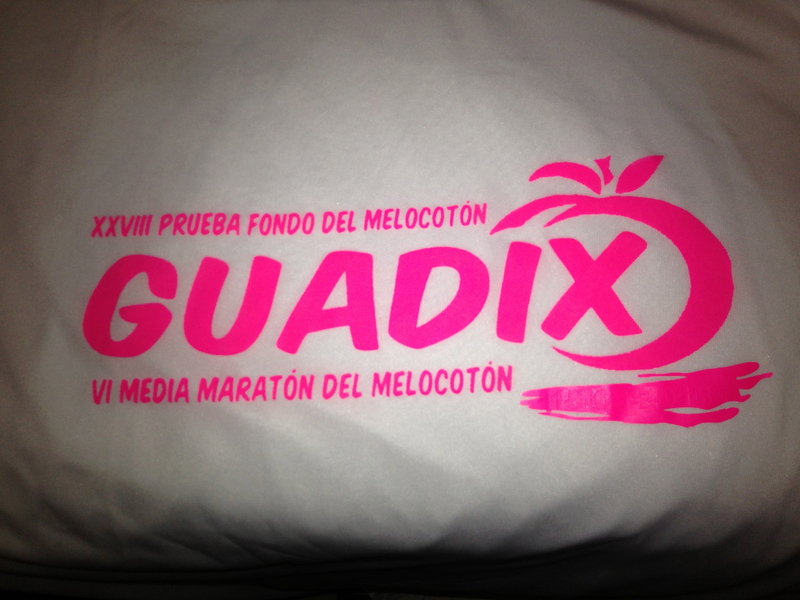 90 minutes later we arrived in Guadix. 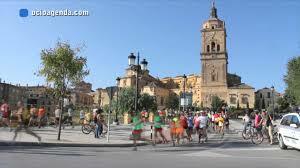 Guadix is a larger, somewhat more modern town than our village, Alhama de Granada. 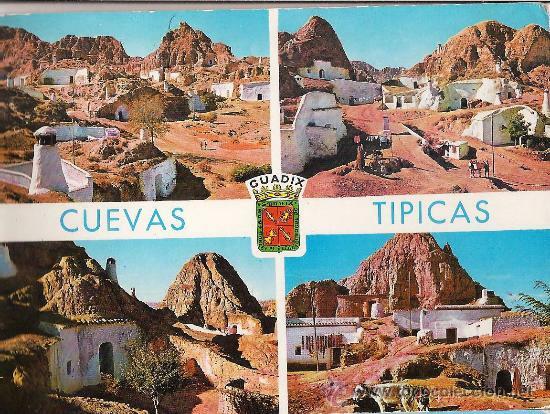 Ironically, there is an area of Guadix where people still live in cave homes built into the mountain sides. The race began and ended in the courtyard of a large church. Paul and Fernando were pre-registered so they picked up their chips. Dominic and I had to register. Fernando explained to me that races like this are subsidized by the government so the entry fee is minimal. Today it was a suggested donation for cancer research of 10 Euros (about 13$). As the government pays for the healthcare if its citizens, it is their best interest to support and encourage activities such as this. I surveyed the crowd. This was a serious group. Most people were grouped together in matching outfits displaying the clubs they represented. It felt like the old days of running in the US where the crowds weren’t necessarily as huge but the participants were serious about racing. I felt happy to stand in the sea of muscled legs and suntanned faces. At the start I placed myself in the middle of the pack next to a friendly girl who admired my Nathan running vest. “Que mochilla tan chula” (cool backpack!). I noticed that no one carried water, normal for a road race. I was the only one who had attached my number to my shorts and definitely the only one with a vest to carry my energy gels and music. I got more than a few looks and comments as I ran the first couple of miles. The race started down a steep hill, my favorite warmup! The race was marked in kilometers but I had my Garmin to check my splits in miles. My first mile was way too fast, 7:30! 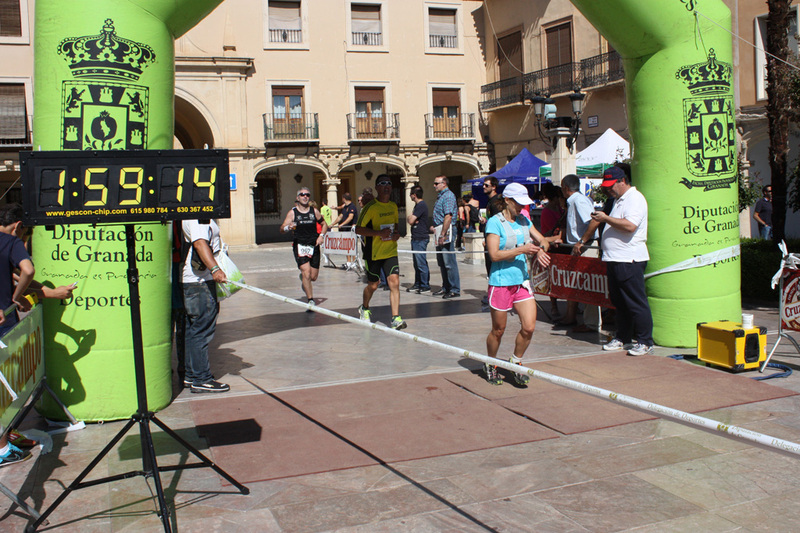 The excitement of the start of a race with 800 other runners down a hill in Spain kept me going and my second split, this time with an uphill mile was 7:35! I pulled back and tried to calm myself down. I knew that I would be suffering later if I didn’t slow down. We ran past cheering friendly faces. “Venga” (come on!) they shouted. I ran past a series of pottery shops on the outskirts of town taking note for future shopping. Taylor Swift singing “loving you is red” in my right ear. We descended out of town to a desolate stretch leaving the cheering crowds back in town. The road steadily became steeper and steeper to about the 8 km marker when to my relief we started back down. By the 12 km (~7miles) marker the spring in my step and the excitement of the start had faded, good feeling gone… I smiled remembering my good friend Kathryn’s words from her first road marathon. I took a mocha power gel. The other racers were slowing too. I passed some walkers. 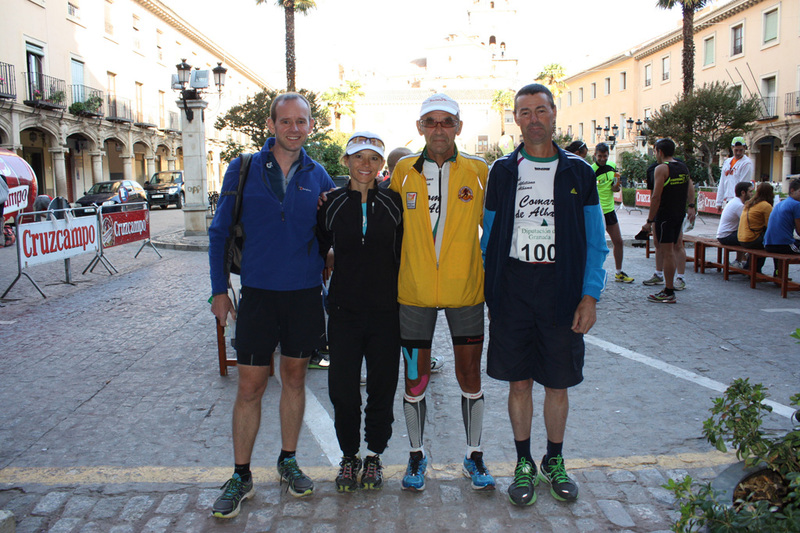 The aid stations were about every 4-5 km. They passed out bottles of water which were nice because they were easy to carry. I passed one woman walking and looking bad. The man beside me offered her his water and she gratefully accepted. He had to turn around and run back about 20 yards to her to pass her the bottle, unusual kindness in a road race. We ran past pastures of happy cows and large farms of tall thin trees that are harvested for lumber in this area. As we neared the town I could hear music and cheering once again. We ran down city streets, closed to traffic. I could see the church and remembered the steep descent from the start. I groaned with 12 miles on my legs as I started up. My Garmin hit 13 miles and I could see I still had blocks to go. I kept telling myself that as long as I didn’t walk that I could run slowly to the finish. I passed the last aid station at the 21 km mark with the church around the corner. They were serving only beer! I ran through the green arch at the finish, happy to be done. There were beer trucks at the finish but no water. I searched for water and was directed inside where I picked up my finisher bag. There was Coke and Cruz Campo beer flowing freely but the only water was in a bottle in the finisher bag. I greedily guzzled the small bottle and refilled it in the bathroom. I found Paul, Fernando and Dominic. Paul was disappointed with his time, his knee swollen and painful looking. I finished behind all of them but was happy to have run 13.29 miles with 800 other athletes so far from California. Shoot, I should have been running through with my arms up! Who knew they were taking my picture! The ride home flew by and I was greeted with lots of love and hugs from my dear family. 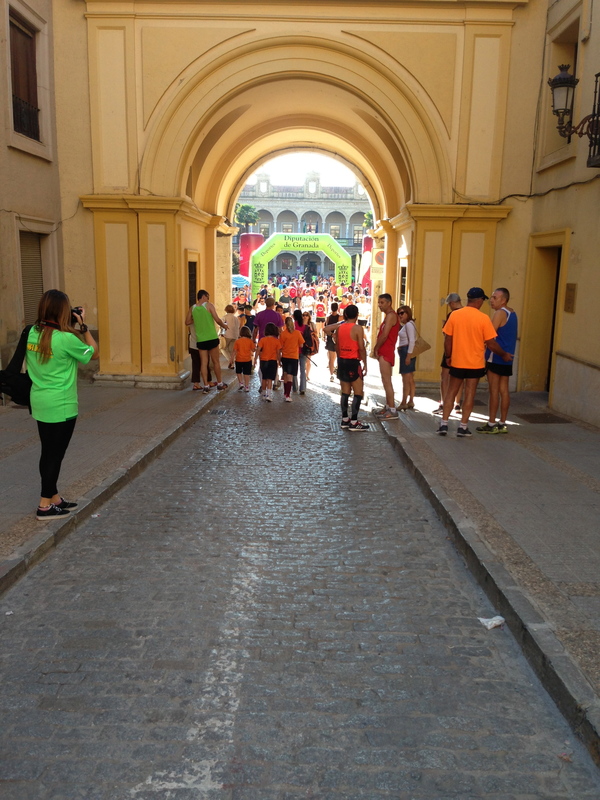 Whew, my first race in Spain. It wasn’t a PR (Personal Record) but it was my best race here!